Our very own West Cornwall GC and Cornwall County Team member Harry Hall (above) finished up the end of his second round on Tuesday morning with a 2-under 70, then fired a final-round 3-under 69 on Wednesday to capture the individual medalist honours by three shots at the Little Rock Invitational, which was played at Chenal Country Club, Arkansas (par 72, 7,326 yards). The latter part of the second round had been suspended on Monday because of darkness. The win for Hall, who is in his third and senior year at The University of Nevada and Las Vegas, marks the second of Hall's career and second of the fall season in just four events. 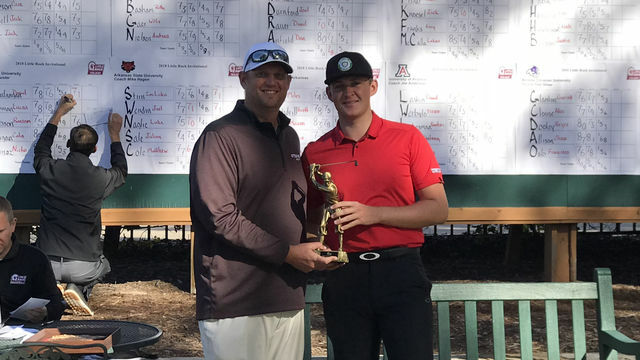 His tie for first place at the William H. Tucker Intercollegiate in Albuquerque, N.M., in September marked the first win of his career. Hall finished the 54-hole event in Arkansas at 6-under 210, while Illinois State's Trent Wallace and Arkansas State's Matthew Cole both tied for second at 3-under. As a team, Hall’s UNLV Rebels finished in second place, one shot back. UNLV finished round two with a score of 2-under 286 and shot 1-over 289 during the final round. It finished at even-par 864 for the tournament. No. 19 Arkansas State won the team title at 1-under. Hall’s final round included an eagle, three birdies and a double bogey but it tied for the low final round of the tournament with two others. Well done again 'H' - we continue to be very proud of you and wish you more and more success as the season continues!